Earlier this week, I got this link from a friend. It tells about an incident where customs authorities seized some containers at Cochin, which were supposed to contain brown paper mix, but actually contained municipal waste from NewYork.. These are a few more subsequent links from other media  ,  and  . The third link cites the name of the company which 'exported' this waste as 'Belsun Corp' . I dug in a little bit into this using Google. I couldn't find the any website for this 'Belsun Corp'. However, this link gives details about its operations in NewYork. It seems it has been in operations since 2000 ( How much Garbage would they have 'exported' to India ?? ) . However, the striking thing is that its president seems to be an Indian ( Sanjay Kedia ) .A google search on Sanjay Kedia listed threw even more interesting results . Now, there is no way that we can conclusively establish that the 'infamous' Sanjay Kedia and the Belsun's Sanjay Kedia are same. After attending the Statistics classes by Prof: Shankar Venkatagiri @ IIMB , I know the pitfalls of going into such generalizations and gut feel even based on comparable backgrounds .. Hence , I'm a little bit reluctant to conclude that both Sanjay Kedias are same based on those Google searches. Though belatedly , SC has criticized Center over its failure on issues like this . I sincerely wish at-least this issue is well-handled & implemented.. These municipal waste could be one of the main sources of diseases like Dengue & Chikungunya which spread far and wide across the southern states sometime back. India has enough waste to dispose or reprocess..Why for a few bucks these people are doing all this nonsense, which'll ultimately cause great harm to themselves ? In this connection, its worthy to read about Alang , the largest ship-breaking port in the world itself located in Gujarat. The wikipedia link has enough information about that.. Alang is another instance where the cost-advantage and lax environmental regulations bring money, but cause great harm to the Nation. Any takers for Vidya Balan :-) ? Quoting the ubiquitous Masala news paper - TOI report about Vidya Balan, "does she have anyone special? Nobody. That’s because most of the people I work with are either married or have girlfriends. So I guess I will have to look outside the industry more sincerely, she says." .... Well..by any chance is she looking towards software sector :-) ? ..
Also read this link too. Quoting TOI again "I've been single for too long:Vidya" ... Tempting ..Isn't it ? PPS - Current music - " Pal pal pal pal ...... "
Some quotable quotes from the pdf ..
1. "Students are expected to spend their free time in the Library/Reading Room. -- Sitting in Raj-path & "looking around" used to be one of the favorite time pass of NITC'ians (or CREC'ians ) from long time back itself.. I wonder who's going to enforce this.. Are they going to appoint someone who'll chase out the students from Raj-Path in a typical school master style ? 2. "NITC Campus is a “Smoking free Campus”. " -- I didnt know that :) ..I'm not a smoker, but I really don't find anything wrong in someone smoking within their confines. 3. "Silence shall be maintained in the premises of the Institute "
intoxicating substances are strictly prohibited in the Campus and hostels." -- Drugs, yes they should be banned .. Alcohol, I don't think. But then thats a highly subjective opinion. -- A point which I agree whole-heartedly .. If there is something that still differentiates NITC from other engineering colleges , its the absence of strikes for totally ridiculous reasons. within the Campus or on any property owned/ managed by the Institute. " Nobody would succeed in life just by scoring a very high CGPA or by getting a top-notch job..If that is your sole aim in college,you are on an awfully wrong track.. Infact to succeed( or rather survive ) in corporate world itself, you need skills to understand , interact and work with people. I believe my biggest gains from NITC was the ability to interact with different people, different situations, and handle failures.. I wouldn't say I've been extremely successful in that..But those lessons still stays with me.. Life is not all about meritocracy..There is much more to it. By churning out an academically supernatural, but otherwise dud 'species' , college would be doing much harm to the students than good. This thing came at a moment when I’m nurturing an idea of blog-based media business. And I couldn’t afford to miss this. Not surprisingly, Arnab Goswami of Times-Now, was quite pro-business.. In between Arnab’s speech, I tend to get a doubt whether this is an extempore or a discussion :) . News channels and news media are basically businesses – Not something that I can digest completely -- with morality and ethics in which they should operate. Even his examples of one-off instances of ethics and morality failed to impress me. Sohail Seth spoke in a typical Khushwant Singh style. Arrogant, laced with humorous ( lurid ?? ) comments, yet quite honest :). Jehangir was quite level – headed in his views..
Should media really invest in reporting the news or does media have a responsibility to change the society ? – I believe yes, but how many of the media channels invest in that? Is media justified in entering into equity arrangements with businesses? Or in general, is a pro-profit socially responsible media kind of an oxymoron? Career options in media – Jehangir’s take is that the scope is more for entrepreneurs. .Hmmm.. good :). To sum it up , individually the content was impressive, but collectively not good. Iphone - Hands on experience finally !!! 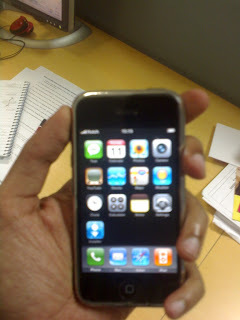 Finally I got to operate an iphone.. And man..what a device..No wonder ppl queued up in front of Apple stores to buy this .. The safari browser, video/audio quality, touchpad keyboard, image quality...everything.. all looks too good.. The picture shows my latest collection from Landmark.. Thanks to my team mates for gifting me Landmark coupon as a b'day gift :) . 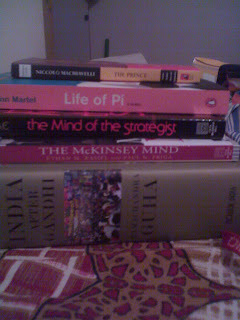 Any opinion / comments about any of these books are welcome..
-- Heard lot of good reviews..And I being a history buff couldn't neglect it :) . Supposed to be an authoritative book on Independent India ..
2) The McKinsey Mind by Ethan Rasiel and Paul Friga ..
-- Any comments from any MBA grads / students ?? -- I know its quite popular, but haven't had the opportunity to read it yet..
-- This is a book for which I might write a review soon after I finish reading it..Have read lot of quotes and excerpts from this book..And they were quite thought provoking ..
Its supposed to be a classic political book ..
-- When Daniel Craig won Poker in Casino Royale, how many of us truly understood that game ? Hunting for online tutorials is a pain..These people have a nice intro to all those popular casino games.. No matter what people say, I love learning card games .. And whenever I get some free time, I'm going to learn these things..
-- This appears good..and I had a quick look at some..They seems to be writing from a neutral perspective. Histories, strategies, advanced casino game guides ( atleast good links to those ) .. Also, maybe getting a VISA/paypal certification would bring in better reputation. Also, a google search of online casinos does not throw up this anywhere in the top..Understandable as it is a new site..However, the surprising thing is that there are no sponsored advertisements in Google Search for Online Casinos, which means bidding for 'Online Casino' through adwords should be easy.. I guess with more marketing , this site can do better. Review Me: Does that work ??? I knew my blog is reasonably popular..But I didnt know that its popular enough for web-masters to get their site reviewed through my blog..Sometime ago I signed up in ReviewMe!, partly out of curiosity , partly because I had some free time.. Yesterday, someone placed an offer through ReviewMe!, to review their site through my blog..And the promised amount is 20$ .. ( which is almost equivalent to 800/- Rs ) .. Just curious about this particular site..Has anyone tried ReviewMe! before ? And do they pay as they promise ? Their payment terms promise that once the total amount that they owe us crosses 25$, they will pay..Now for thats just completing this review and scouting for another review through their site...But still skeptical about their payouts..Anybody had any prior experience with this ? Please comment here or mail me if you had any experience with ReviewMe!. Anyway I'm giving a shot..Will be putting up the site review soon..